Port 1 Normally Open—The normally open terminals of the relays. Port 1 Common—The common terminals of the relays. Port 1 Normally Closed—The normally closed terminals of the relays. 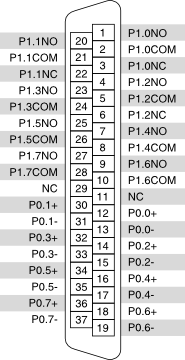 This is the default state for the Form C relays. Port 0 Isolated Digital I/O Channels—Both the positive terminal and the negative terminal serves as the signal input. You can connect either end of the input signal to it, regardless of whether the level is positive or negative.